Poop Bags – Regular plastic bags from the supermarket work just fine, but there are many varieties of recycled bags that offer an eco-friendly solution to your dog poop disposal needs. Poop Bags have been around for a long time and offer three types of environmentally friendly options. Urine Cleaner – It is inevitable that your new puppy will have accidents on clean carpet and quality furniture. Good pet urine cleaners will fight stubborn pet odors better than regular household cleaners. Training Treats – The best training treats are small, soft beef or liver treats that you can easily keep in your pocket. Nature Balance makes a great mini reward that dogs love. Quick Grooming Wipes – These are the BEST option to quickly clean up any mess that clings to your dog. Petkin sells a wipe that keeps your dog smelling fresh and clean all day long. Bag of Towels – Sold at most home improvement stores a big bag of cheap towels is a must-have. You don’t want to use the nice towels in your bathroom closet cleaning up the inevitable puppy accident. Identification Tags – Don’t wait! Puppies get loose easily and quickly. Make sure your dog has an ID tag on their collar when they come into your home right away. 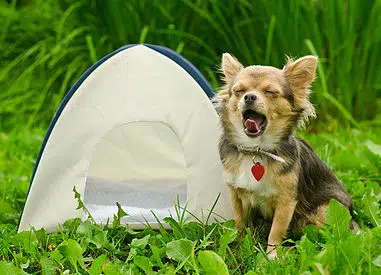 Calming Products – Calming treats and pheromone sprays are lifesavers if you have an anxious puppy. Just because your puppy was calm when you picked him up, does not mean he will be calm the first few days in a new environment. Baby Gate – You will want a baby gate to keep your puppy confined to one area. Baby gates are useful when you are potty training your dog and they are not quite ready to have the run of the house. 24 Hour Vet Service – Put the name and number of a reputable 24-hour vet service in your phone contact list. New puppies get sick at times, and it is important to know where to take them for help at all hours. Puppy Sweater – Puppies can get cold just like babies. A sweater will make your new puppy feel protected as they adjust to their new family. Buying a new puppy is an exciting time for everyone and the more prepared you are, the more success you and your new dog will have as you become a family. Good luck and enjoy your new furry friend!